Our split sheath cartridge heaters solve several issues with conventional high-density heaters, the Expandable range expand to fit low tolerance holes, filling air gaps that cause poor durability and helps ease the problem of fit & extraction of cartridge in problem and normal holes. The better fit also helping improve the accuracy of the temperatures achieved in your process. 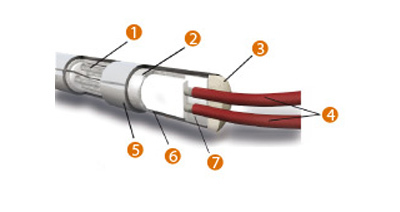 These come with many different terminations and cable options – and are suitable for all types of industry. The Expandable Heater consists of a compressible cartridge heater with high performance and made of the highest quality materials, with the ability to expand itself thanks to the Tong-shaped bend feature that allows the expansion and contraction of the cartridge within a hole. In the expansion process the expandable cartridge fits the walls of its housing, providing the correct transmission of the temperature, and avoiding the "oven effect" that occurs in other types of cartridges poorly dimensioned with respect to diameter and housing. The drills that for any other circumstances are oversized have with the expandable heaters the best solution to allow more adjustment tolerance. At the contraction process the Expandable Heaters come back to their original status, facilitating a smooth removal from the orifice, with the subsequent advantages like not having to drill the mould again, reuse them in other locations, reduce the stock since it will have the same diameter for different drills, etc. The Expandable Heaters are manufactured with an internal compacting system of all its components in order to increase their lifetime. The Nickel/Chrome 80/20 conductor wire is introduced into the cavities of a ceramic body which ensures the required the required separation in order to obtain the correct insulation. Fully coated inside with a magnesium oxide powder to ensure the complete cartridge is filled. Later comes a compacting process and a treatment of the surface until the desired tolerance is obtained. And finally, a rigorous quality control that guarantees the best operation of the cartridge. 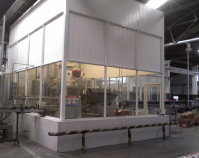 The facilities and the unique building system ensure the maximum purity inside guaranteeing a longer lifetime. 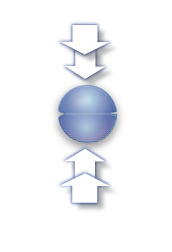 All possible endings that you may require for all underwater applications, i.e. vibration, high temperatures, special food use, corrosive and saline environments, etc. 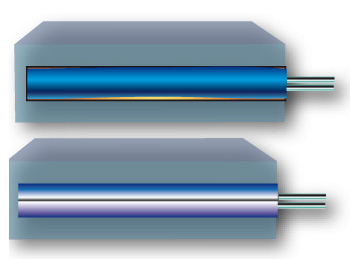 The cartridge heater can be manufactured with a probe built into the cartridge sensor, at any point upon request. The advantages of incorporating sensors are many, for instance; longer cartridge life, localised temperature accuracy, energy saving, and applications where you cannot accommodate a conventional sensor due to space problems. Leakage current* <=0.5mA a 253 v.
The Expandable Heaters are made with just one heating wire, it's coil is shaped so that it has a much greater quantity of wire than any other model of cartridge heater. 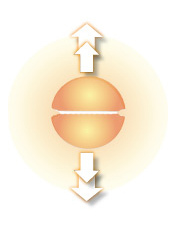 We obtain through this a uniform heating through the whole perimeter, without any cold areas or temperature variations. The pictures below are a comparison of our expandable range against other competitors similar products. 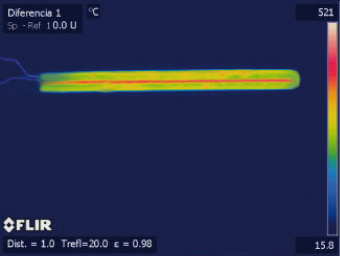 Compressed high charge cartridge heater thermography. Several cold zones observed, especially in the centre of the heater from 250 mm. 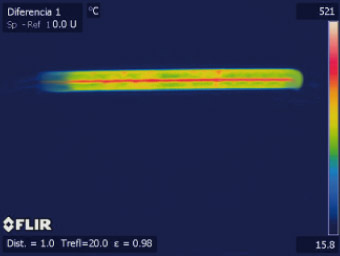 Ordinary bipartite cartridge heater thermography. It is observed cold spots at the end of the connections .This does not uniformly heated mould or application. 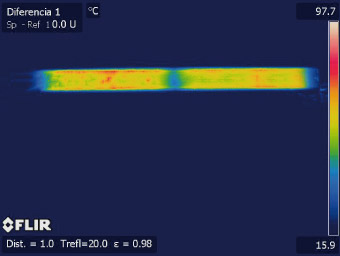 Clearly shows the absence of cold zones thanks to its unique construction, which allows more heating wire in the whole area of the cartridge including the connection areas. The heater that fits the hole. The expansion around the perimeter of the cartridge makes of the Expandable Heater the best solution for enlarged hole diameters, caused by wear, expansion or made with poor tolerances. The adjustable fit of the heater is obtained from the distance between the surface of the cartridge and the inner wall of the hole, which should be uniform throughout its length. Extraction, a faster and easier fit even in longer lengths. 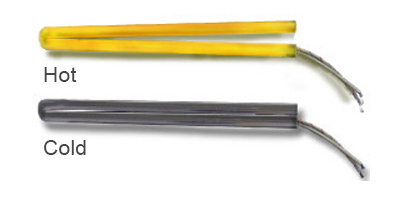 Expandable heaters, with its unique construction, allow the easy removal when the cartridge is cold, saving time and considerable effort, minimizing machine stoppage time and human resources. No adjustment paste is needed and you will not have to drill, destroy or perform expensive operations to remove the cartridge. You can reuse the Expandable Heaters in other moulds that need to be heated. Longer lengths, which will not bend, is the main problem with conventional cartridges, but thanks to the shape of our product it expands evenly around the perimeter, so heat transmission is uniform without creating gaps which produce overheating and failure of the resistance wire. All of the intermediate sizes can be made in diameter and length, volts, watts distribution, cold areas, special finishes, finishing, etc. 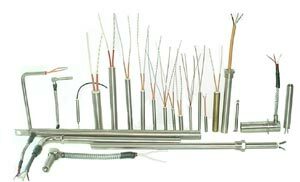 Our Longer Service Life "The Difference"
There is more Nickel/Chrome 80/20 heating wire in our Expandable Heaters than in a bipartite heater or a compressed cartridge heater with the same compression. The principle feature is that with more heating wire, you get a larger diameter for the same amount of watts. This larger diameter reduces fatigue and wear of the heating wire, resulting in a longer service life.